Have you ever read the "Splurge vs Steal" section of Marie Claire magazine? You know, the section that shows you witch Target nail polish will look exactly like the Chanel one you really wanted. How about the "Just Like Us" section of Us Weekly? You know, the section that shows you how walking your dog at 5am so they won't eat the couch while you're at work is exactly like walking your dog at 2pm on a Tuesday in sunny Brentwood. Totes the same, right? Those are always my fave parts of magazines - Cooking Light included! My favorite pages in Cooking Light are the "Feed 4 for Under $10." Love it! Sometimes they are not that cool, like another grilled sammy. But oftentimes they are awesome. This one is awesome. It's been on regular rotation in our house since I first read it back in 2010. I love Better Than Bullion for recipes that call for a small to medium amount of broth. It's easy to mix up however much I need, it keeps in the fridge for a long time, and I don't waste cups at a time from a larger carton. In a large, high sided pan, cook sausage and red pepper flakes in olive oil until browned on all sides, about 5 minutes. Add in mushrooms, onions and garlic and cook until onions have softened and mushrooms are tender. About 7 minutes. Add in salt and canned tomatoes. Simmer for about 15 minutes. The mushrooms will release all of their juices and the sauce will become richer as it cooks. While the sauce cooks, start on the polenta. Boil the water and chicken broth in a pan with a lid. Once the liquid boils, add in the polenta and stir well. Cover and reduce to a simmer. Cook for about 15 minutes, stirring occasionally. Cut the cream cheese into chunks and stir it into the polenta until well incorporated and smooth. 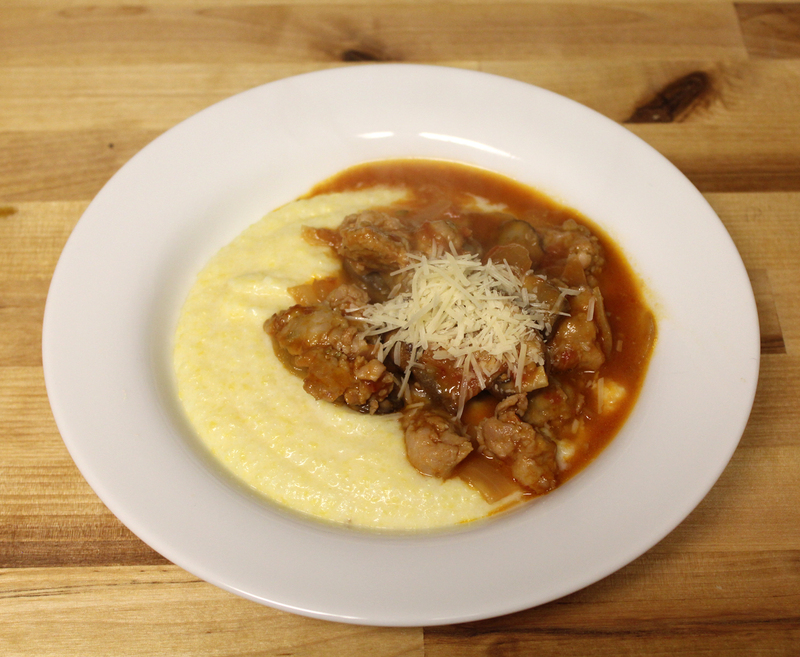 Dish up polenta and spoon over the mushroom ragu. Top with a bit of Parmesan cheese for some extra goodness. I'm always looking for ways to lower meat and up veggies in recipes. I've made this with a lot of zucchini and no meat. I've also added roasted red peppers. Alternately, I've made this with chopped chicken thighs and even with sliced steak. It's really adaptable. Grits is polenta. Polenta is grits. Both are just coarse-ground cornmeal. Antoinette has a great Shrimp and Grits recipe... check it out here.